All the tech press can talk about these days is machine learning, voice control, and home automation. Three things that you cannot do with an Apple product. That will soon be a thing of the past, according to Bloomberg correspondent and renowned Apple tipster Marc Gurman. 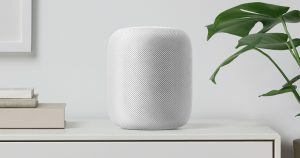 According to Gurman, Apple will announce the Siri-powered home speaker at its annual developer conference WWDC with it going on sale towards the end of the year. The product is now in manufacturing and will early next year or late this year. There is no indication on pricing, but it is expected to retail well above the competition. The device will differ from Google Home and Amazon Echo in several ways. Firstly, rumors point to a hi-fidelity speaker, unlike the competition. The unit will sport one woofer and seven tweeters and be positioned as a hi-fi audio product. Secondly, it will also come with some form of virtual surround sound. Finally, the device will integrate heavily with Apple’s ecosystem.